Truck repair and maintenance costs have increased by more than 60 percent since 2008. While new equipment offers a host of benefits such as fuel efficiency and improved safety technology, it is costlier than ever to maintain and repair due to ever-changing and more advanced features. As a result, technicians are needing to expand their knowledge and skills to service these complex machines. Technicians boasting such skills come at a price significantly higher than just a few years ago, causing a number of carriers to outsource the maintenance of their trucks instead of paying the price to attract and retain highly-skilled technicians. In this article, you will learn more about these technological advancements changing the game for trucking and how Ruan's fleet services team is keeping up. 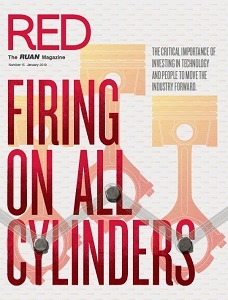 Read the article here from our latest issue of RED Magazine. What to check out the whole issue? Click here!